The Skirball Cultural Center, which stands at the crest of Sepulveda and Mulholland just west of the 405 Freeway, was built on a dump. Literally. Who knew? Before the Skirball acquired the land, it was a garbage dump. With its opening in 1996, architect Moshe Safdie, in his first commission in the United States, transformed the site into a campus of concrete and granite pavilions, set into the hills, following the curves of the river of traffic that runs through the Sepulveda Pass. Designed to be built in phases, as visitors and needs arose (and as funds were raised), the Skirball has extended over the past three decades to the south with the additions of Winnick Hall and Noah's Ark, and to the north with Ahmanson Hall, and now finds completion with the Herscher Hall and Guerin Pavilion, to be unveiled this fall. The design for the new buildings fits seamlessly with the older ones, as if it were always there just waiting to be built. Its walls of windows afford beautiful vistas of the hills, and, inside, it contains a 9,000-square-foot multiuse hall, a 4,000-square-foot kosher kitchen, and meeting rooms ready for a class, a screening or even a Korean tea ceremony. While the completion of this fourth and final phase of Safdie's Skirball campus is cause enough for celebration, the exhibition "Global Citizen: The Architecture of Moshe Safdie," which opens Oct. 22, will excavate the singular career of the Israeli-born architect who holds passports from Israel, Canada and the United States. Perhaps best known for his design for Yad Vashem, Safdie's name has been counted among the top of the list of the many great architects of our time, such as Frank Gehry, Jean Nouvel, Richard Meier and I.M. Pei. The exhibition was originated at the National Gallery of Canada in 2010, organized by Donald Albrecht, curator of architecture and design at the Museum of the City of New York. "The exhibition is called 'Global Citizen' not only because Safdie is a citizen of the United States, Canada and Israel," Albrecht explained recently, "but because his architecture projects all over the world... bring diverse people together." As Albrecht notes in the catalog, it is "Safdie's intention to use architecture not only to express, but also to generate, open engagement in community life." Organized chronologically, the exhibition includes models of some of Safdie's best-known works in Canada (Habitat 67 and the National Gallery of Canada in Ottawa), in the United States (the Skirball, the Salt Lake City Public Library, Crystal Bridges Museum of American Art), in Israel (Yad Vashem, the Mamilla Alrov Center, a multi-use urban center near the Old City of Jerusalem, and Ben-Gurion Airport) and elsewhere (among others, the Khalsa Heritage Center of Sikh culture in Punjab, India, and the planned Jumilla Mosque in Dubai). The show also includes designs for projects and entries for architectural competitions that were never built, as well as films that will be screened in the galleries to give a sense of the experience of interacting with the three-dimensional built spaces. 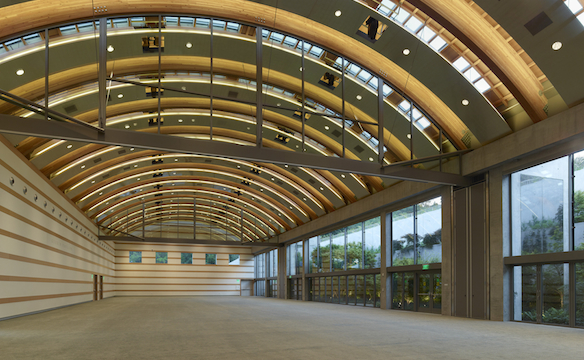 The exhibition organizes Safdie's career into several phases. To begin with, he was born in Haifa in 1938, and the mix there of cultures and religions, as well as the proliferation of modernist stacked housing on Mount Carmel, had a profound influence on him, all the more so because his family moved to Montreal in 1953. Memories of Haifa can be seen in Safdie's groundbreaking undergraduate architecture thesis at McGill University, a design for a modular building system using prefabricated forms fashioned into stacks of individual homes with terraced gardens, which would become Montreal's Habitat 67 (one of the prefab molded bathrooms is showcased in the exhibition). Meant to be scaled for a variety of locales (Manhattan, Puerto Rico and Tehran), Habitat never was built beyond its initial Montreal development. Indeed, in the years that immediately followed Habitat's completion, Safdie's work met with resistance, as can be seen with his unsuccessful submissions for the student union at San Francisco State University, and for Paris' Centre Pomidou, both of which went to other architects. Safdie returned to Israel following the Six-Day War to complete his military service, and in 1970 moved to Jerusalem, where he opened an office. This began the second phase of his career, notable for projects at the Hebrew Union College campus, the beginning of his work on the Mamilla complex and at Yad Vashem. In these, we see the emergence of the elements of Safdie's distinctive architectural vocabulary, all profoundly influenced by Jerusalem's Old City: his mixing of concrete, stone and granite, which allow the architecture to fade to the background, highlighting instead light-filled passageways, either open-air or skylight-enhanced, and a predominance of simple geometric forms in the buildings, as well as the walkways, plazas and gardens. The third phase of Safdie's career extends his work to North America, and can be seen in his consistent selection as designer of significant cultural centers, including the Skirball in Los Angeles; the National Gallery of Canada in Ottawa; the Exploration Place Science Center in Wichita, Kansas; the Peabody Essex Museum in Salem, Mass. ; the Salt Lake City Public Library in Utah; the United States Institute of Peace headquarters in Washington, D.C.; and Crystal Bridges Museum of American Art in Bentonville, Ark. Striking in all these endeavors is how they all are designed to be enjoyed by a large and diverse stream of visitors. The other striking feature is that with the exception of the National Gallery of Canada, whose glass structure echoes Ottawa's landmark towers, Safdie's designs generally do not call attention to themselves. They continue, in this phase, his use of geometrical forms derived from nature but greatly abstracted (sometimes by benefit of computer design). The buildings harmonize with their surroundings rather than stand out, and they are not afraid to be grand, but are incomplete without the presence of people interacting with their spaces. And, it is important to note, Safdie's public projects have been overwhelmingly popular. Salt Lake City's library has been called "America's unquietest library," and the Crystal Bridges Museum, commissioned by Walmart heiress Alice Walton and opened in 2011, has exceeded all projections for attendance. 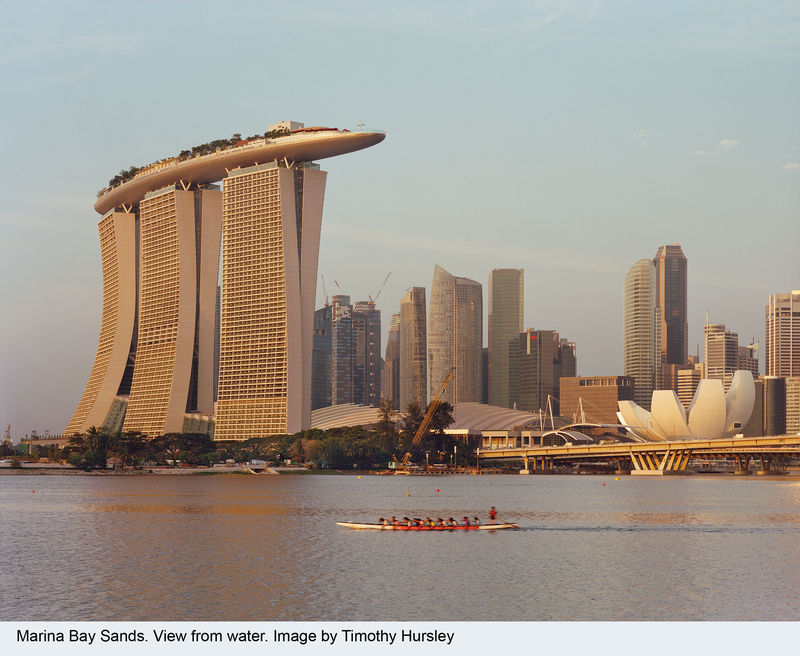 The fourth and current phase of Safdie's practice is an increasingly global one, with the Khalsa center in India, the Marina Bay Sands complex in Singapore (commissioned by Sheldon Adelson), and proposals for the Guangdong Science Center in China and the Palm Jumeirah Gateway Mosque in Dubai. These are monumental projects, and for them Safdie's architectural statements, particular in the Khalsa center, are bolder. Yet they retain his trademark order and elegance -- no Gehry-esque dissonant clash of squiggly lines for Safdie. While some architects' designs for museums and buildings make the outside more famous than what's inside, Safdie's work is different: His architecture often takes a back seat to its surroundings and to its purpose, whether residential, or public space, or multipurpose. Safdie aims to accommodate a jumble of people flowing smoothly through a variety of experiences. What "Global Citizen: The Architecture of Moshe Safdie" does is make us appreciate his artfulness in doing so.